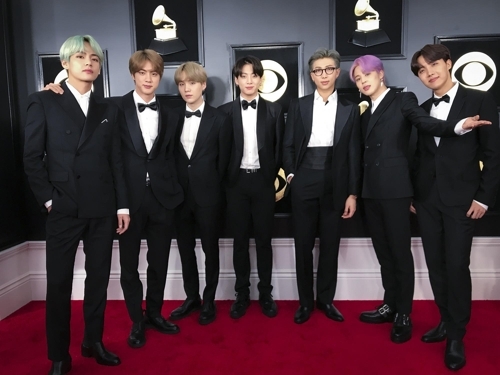 The K-pop boy band sensation BTS called their debut on the Grammy stage on Monday a moment when their dreams came true, voicing their hope to return to the prominent music award ceremony in the future. 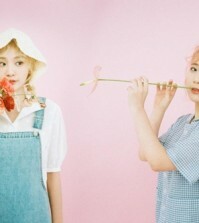 “Growing up in South Korea, we always dreamed about standing on the Grammy stage. Thanks to all our fans for making this dream come true,” BTS leader RM said after the band took the stage to present the Best R&B Album award during the 61st Grammy Awards on Sunday (U.S. time) at the Staples Center in Los Angeles. RM implied the group’s determination to leave further footprints on the Grammy stage in the future, by saying “I will be back.” “Fake Love,” one of the band’s latest songs, was played in the background as BTS came to the stage. “I can (see) so many artists. It’s exciting,” BTS member Jin said in a brief interview on the red carpet before the ceremony. “(It’s a) dream come true,” member J-Hope noted. 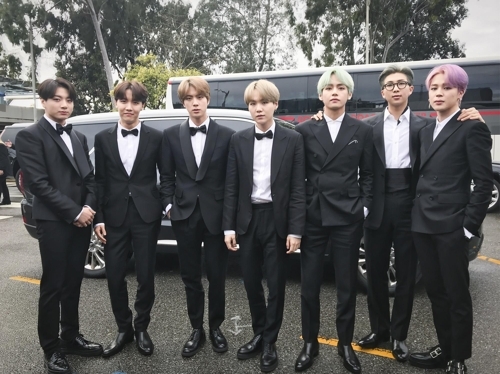 Suga also expressed his thrill, saying, “I cannot believe it,” as the seven members appeared on the red carpet clad in sleek black tailored suits. “There could be collaboration songs and some joint songs,” he said after being asked about the possibility of more collaborations with other artists. “We don’t know (yet). We are working on it,” he said. 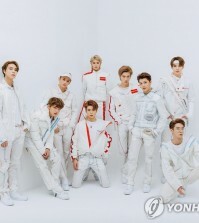 Grammy Awards was the last of the three major American music awards the globally-celebrated K-pop band has debuted after the band picked up the Top Social Artist Award and premiered “Fake Love” during last year’s Billboard Music Awards before the band performed at American Music Awards later in the year.